Obtaining a Pilot’s Certificate and owning an airplane isn’t just a rewarding experience, it’s also a rare one. Only a small percentage of the populace has the skills and freedoms associated with flying and there’s no question that an aircraft offers travelers many benefits. Perhaps chief among these benefits is the ability to make the world (or at least, your little corner of it) a lot smaller. Just where and how far the family car can go in a day or a weekend is limited, but when the family car is an airplane, everything changes. Still, the skies are not always blue and weather has a way of holding us back. For many, the solution is an Instrument Ticket. With the skill and the experience associated with “IFR” flying under their belts, a family can venture out to cover more territory, discover new adventures outside of the realm of most non-pilots, and, most importantly, know that getting home safely will not likely be an issue. We’ve already looked at the needs of the VFR pilot (September 2013) and the “light” IFR pilot (November 2013). As discussed, the “light” IFR pilot is typically low-time or simply chooses to be very conservative in the way they use their IFR ticket. In this installment, however, we’ll look at the pilot and his avionics needs when more serious IFR flying is anticipated. The IFR Pilot – Unlike the “light” IFR guy, this pilot has some hours in the logbook and a good amount of time in the clouds. Because he knows that his flying could be IFR at any time, he keeps himself sharp. He’s also been in “weather” before, so he knows his comfort zone and his avionics panel is consistent with his IFR flying goals. An occasional approach to minimums is not an issue. When I got my private ticket in 1971, the avionics available were rather archaic. By the time I got my Cherokee Six in 1986, the avionics had improved some, but the capability was about the same. A typical IFR aircraft (like my Six) had an audio panel and dual nav-coms—one with glideslope, a Mode C transponder, and, in the case of my Six, a DME. The Six also had a Piper Autocontrol IIB single access autopilot, very popular in its day and still in use in many “legacy” Pipers today. In legacy Cessnas, you’ll often find the Cessna 300 Series autopilots in the same role. Communications were okay, although Flip-Flop was not that common in the mid-80s—you could dial in only two frequencies at a time. You had the capability to navigate by VOR and had glideslope capability when you got to a bigger airport. Small airport landings in weather were by VOR, DME, or the dreaded ADF. Long range navigation was by Loran-C—there was no GPS. Flying IFR direct required IFR Loran or RNAV and, with the support of two VORs and a DME, allowed you to artificially create waypoints, bypass the airways, and (with the blessing of ATC) fly direct to an airport. Flying IFR required flying skills and confidence in your abilities, but it also required constant attention to the instruments, the charts on your lap, and a good “imagination.” Through triangulation, the instruments told you where you should be, but you had to trust your instruments. There was nothing other than ATC to confirm your exact location. Surprisingly, with few exceptions, today’s airplanes haven’t changed that much. In fact, you can still buy a Cherokee Six, (factory new—if you have the budget), but the aircraft’s performance isn’t significantly different than it was back then. The avionics panel, however, has changed a whole lot and the “tools” available to the IFR pilot today have replaced imagination with real-time situation and weather awareness. Per our previous installments, let’s start at the top of the panel and take a look at the IFR tools available to today’s IFR pilot. Though an audio panel plays little role in VFR aircraft, two reliable comms are a necessity in the IFR environment and the ability to reliably switch between those radios is imperative. Modern audio panels are jam-packed with features for the IFR pilot. In a family aircraft with children on-board, the ability for the pilot to isolate himself from backseat intercom chatter is essential, especially in busy terminal traffic. Common in most intercoms, this feature is called pilot isolate. In situations where the co-pilot is sharing flight responsibilities, crew isolate, found on new/better audio panels, grants the flight crew the ability to communicate amongst themselves while backseat passengers can talk and enjoy music. Modern audio panels go one step further by offering split transmit capability. This allows the pilot to maintain contact with ATC while the co-pilot simultaneously communicates with Flight Service on the other radio. Until just a few years ago, this feature was typically found only on larger aircraft. Another feature found on the better units is digital recording. This allows radio communications (like IFR clearances) to be re-played at the push of a button. New IFR pilots find this feature comforting and it can limit the old “say again” phrase that pilots just hate to say! And, while music may seem like a luxury in this environment, the right music may actually calm the nerves and reduce some of the “tension” that’s a part of IFR flying. Modern audio panels take music out of the equation automatically when there is radio traffic or when anyone talks on the intercom. Therefore, music is never a distraction and can be appreciated, especially by the kids in the back seat. But don’t worry—modern audio panels allow the front seat passengers to listen to Bach, while the kids listen to Snoopdog in the back! We’ve already established that reliable dual comms (and the role the audio panel plays in controlling them) are a requirement. Fortunately, aviation radios have come a long way since my Piper Colt in 1971 and my Cherokee Six in 1986. The first significant improvements were digital displays and channel flip-flop. In the course of an IFR flight, you’ll make significant frequency changes. A successful IFR flight requires that you stay ahead of the aircraft and the chores at hand. Flip-flop capability allows you to pre-program four frequencies into your radios to help you stay ahead of communications. Recently, communications manufacturers have added yet another desirable tool. The monitor feature allows you to monitor both the active and stand-by frequency at the same time. This allows you to get that all-important ATIS information in the background while remaining in solid contact with ATC. The stand-by frequency is at a reduced volume making it easy to distinguish between the two. We won’t spend much time on VOR or ADF here. The role of the precision ILS approach remains significant today and appears to be around for a while longer. A nav source with glideslope is still a must in any IFR platform. Long range navigation, terminal, and approach functions at smaller airports are now dominated by GPS. Today, it’s hard to imagine any significant IFR aircraft without an IFR-approved and certified GPS (or two) on-board. You’re in some weather (that weather should depend on your skills and your tools) and you lose your primary nav source with glideslope. You now have a nav with VOR only and an IFR GPS—you’ve lost ILS capability. Are you comfortable with only a VOR or GPS approach? If your answer is “no,” you’re probably a good candidate for dual glideslopes. Most new GPS units feature a significant moving map. The GNS-430 first gave way to the 530 with a larger display and map. Today, both have been replaced by the GTN Series from Garmin. The marketplace should also soon see the new Avidyne IFD-540 and 440 and, later down the road, the Bendix King KSN-770 (now being manufactured by Aspen for Bendix King). Frankly, Garmin’s doing a good job, but ongoing competition is good for both pilots and the industry. As I said, it’s hard to imagine an aircraft and a pilot with aspirations of light-to-medium IFR flying without one of these units onboard. The earlier generation of IFR GPS units is drying up; and while one of these older versions may still meet the needs for light IFR, if you plan to spend much time in the clouds and plan to be doing approaches near minimums with any consistency, you’ll need one of the newer models. For some pilots, WAAS-corrected GPS is a luxury—for others, it’s a necessity. For most of us, the difference between what we want to do and what we need to do with our airplane comes down to our budgets. The benefits of WAAS and the pending requirement for ADS-B equipment means that sooner or later, you’ll need it. Do your homework and recognize the features and benefits of these units before you add one to your aircraft. Or, buy an aircraft with one of these on-board. If you need advice, seek a good avionics consultant and get help. Let’s assume that your primary Nav-Com/GPS is one of the units mentioned above. You’ll need a reliable #2 unit for communication and navigation. If you fly enough IFR, have the budget, and plan to keep your aircraft long-term, then you may choose to add a second integrated navigator like those above. If you’re shopping for an aircraft, try to find one so-equipped. For those who don’t meet that criterion, a good reliable Nav-Com will do the job in the number two slot. The problem is there are fewer options worth considering. Narco used to be a decent alternative to the Bendix King KX-155, but Narco is gone and so, it appears, is any support. The KX-155 is still a solid player with one exception—displays. Note that the KX-155 has been around for a long time so if you’re shopping for one, try to get a late-model, 760-channel unit and make sure that the display is good. If you’re upgrading your avionics and adding a Com/Nav/GPS in the primary role, I recommend keeping your existing Nav-Com with glideslope. The trade-in difference is insignificant and it’s a nice thing to have. If you’re inclined to purchase a new number two nav-com, the only option I’d suggest is the Garmin GNC-255 unit. I would not recommend buying a new KX-155. The GNC features newer digital technology and is actually less expensive than a new KX-155. The choice of a number two Nav-Com is another personal decision. If your primary has stopped working and you’re now depending on your number two nav-com, can you really depend on it? Any aircraft that spends time in the clouds should have an autopilot. A high-time IFR pilot may have the confidence and experience to handle flying the aircraft and managing the flight, but the average IFR pilot can and should appreciate the benefits of pushing a button and knowing the aircraft is straight and level. Unless you have someone in the right seat that can do this for you when you’re in IFR conditions, you should have an autopilot, even a basic wing-leveler. With the push of a button, the new generation of digital autopilots has a feature that brings the aircraft to straight and level flight from virtually any unusual attitude. A standard autopilot does not do this. Any pilot who has tasted even the slightest moment of spatial disorientation should appreciate this feature and recognize its life-saving benefit. After all, 10 – 15% of all GA accidents are caused by spatial disorientation—sadly, 90% of these accidents are fatal. Unfortunately, adding or upgrading an autopilot to an older aircraft is expensive and can be hard to justify, unless you see a long-term relationship with the aircraft. If you’re shopping for an aircraft and planning IFR, try to find an aircraft with a good-functioning autopilot installed and have it thoroughly checked during your pre-purchase inspection. Pay a little extra if the aircraft has a late-model autopilot vs. an older legacy autopilot. Older autopilots can be expensive to maintain and the maintenance savings may justify the additional purchase price. 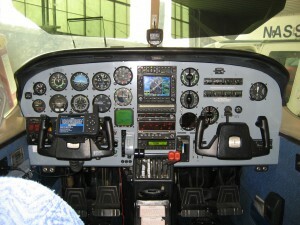 The equipment above is pretty much what you must have on-board to fly light-to-medium IFR. Yet, the real improvements in avionics in the last 10 years have been in the area of Situation and Weather Awareness. Ten years ago, the buzz word in GA avionics was MFD (Multi-Function-Display). At that time, big screen integrated navigators like the GNS-530 had their limitations. In the early 2000s, UPS AT introduced the MX-20 MFD which offered a desirable alternative and an MFD became a real IFR tool. The MX-20’s screen quality was better, terrain awareness was included, and, with the addition of electronic charts and approach plates, a new and desirable tool for situation awareness was available to the IFR pilot. Since then, integrated navigators have grown larger, screen quality has improved, and there are more interface options. The only limitation is how much information you want to put on a single screen. If you plan to have approach plates, radar, traffic, and weather sensors on board, you’re probably a candidate for an MFD. If you plan to have dual navigators (like a GTN-750 and 650 or the Avidyne IFD-540 and 440), you can probably split the information between the two and still be okay. Now, let’s look at these sensors and their features. Nothing has improved situation awareness more for the IFR pilot than the advent of the moving map linked to a GPS. Now, you can see exactly where you are—not only en-route, but with electronic approach plates, you see exactly where you are (or should be) on the approach. If you’re spending a large amount time in IFR conditions, these are well worth the investment. Remember, you can accomplish the first part, the moving map, with a good portable unit. Again, I think a good portable GPS belongs in any IFR aircraft. Think of it as a “life raft” in the event of an electrical failure. 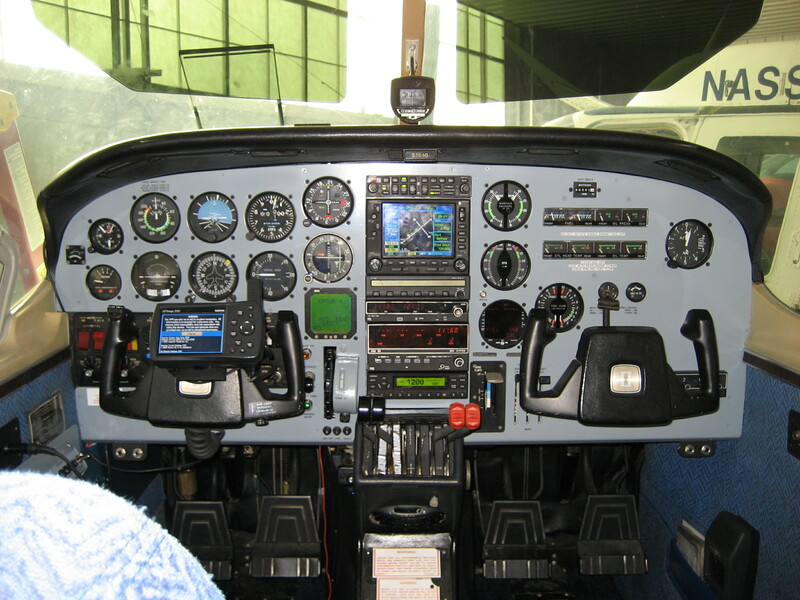 Plus, with the introduction of the Airgizmo, they can be installed in the panel, eliminating the concern about all the wires running around the cockpit as is often associated with yoke mounting, but check with the FAA before trying this—not all FSDO offices allow it. Electronic Approach Plates, like Chartlink (Garmin) and C-Max (Avidyne), put the approach plate on the screen in front of you and display your aircraft right on the plate. You can’t ask for better situation awareness than that when you’re in approach mode! If you’re in IFR conditions because of weather, it’s comforting to know what (and where) the weather is around you. You can’t always depend on ATC to keep you out of trouble. Onboard radar has been the “active” tool for larger aircraft for years, but it has its limitations as far as application (twins) and technology. Radar measures precipitation, so it’s a good tool if you know how to use it, but it’s also quite expensive to install. Now, consider what you’re trying to avoid. You’re not really concerned about hard rain, but you are (and should be) concerned about flying into the center of a thunderstorm! It’s the tremendous turbulence and the possibility of hail in the center of a cell, not rain, you want to avoid. Typically, even a lightning strike isn’t a major concern in a metal aircraft—though it’s a different story for composite aircraft! The power of a thunderstorm can tear an aircraft apart or render it uncontrollable. Back in the early 70s, I flew out of the same airport as famed lawyer, F. Lee Bailey. At the time, Lee, as he was known locally, owned a Beech Duke. I knew his pilot who shared details of a flight he’d had. The Duke was radar-equipped, but was being vectored around weather when it suddenly found itself inside a cell. “One minute I was descending at 2000 FPM at full throttle, the next minute I was climbing at 2000 FPM at idle,” said the pilot. “The the main chore was simply keeping the wings level!” Fortunately, no hail was encountered, but can you imagine losing a windshield in these conditions? Fact is, ATC was using the same technology as the Duke to avoid the weather—radar. If you want an “active” on-board tool to avoid such circumstances, I suggest a Stormscope. It’s considerably more affordable to install and it can be installed in both singles and twins. Weather can be displayed directly on your MFD or Navigator and “overlaid” onto your map for excellent weather awareness. It shows you, with good accuracy, the exact location of thunderstorm cells in real time. If the above-mentioned Duke had a good Stormscope installed, it may have avoided it’s rather precarious situation. Today, the WX-500 Sensor, from L3 Communications, is rock solid and, I believe, one of the best “active” weather tools available to the IFR pilot. Active weather technology, like the Stormscope, is a great “defensive” tool that gives you real-time feedback—even better, it’s not dependent on anyone else. That brings us to “passive” weather options. Even manufacturers of passive weather equipment will tell you that you should seek “active” options first. Passive weather, like Nexrad, is a planning tool and not recommended for primary weather avoidance. Its pluses are that it’s pretty affordable, especially when installed on that portable GPS we discussed. It also has a range way beyond the scope of radar or a Stormscope (about 200 NM). With Nexrad, you can see the weather “picture” at your destination airport 400 miles away and make or adjust planning decisions accordingly should things look bad. Nexrad weather information is collected and re-broadcast to your aircraft. This information is generally about five minutes old, so in the case of intense thunderstorm activity, this may be “old” information. If you want a good handle on weather awareness, I suggest the combination of a good Stormscope and Nexrad. In VFR conditions, avoiding other aircraft is a “see and avoid” scenario. In IFR conditions, seeing is not always an option and you can’t always depend on ATC for reliable separation. One of the primary goals of ADS-B is to provide you with reliable traffic separation without any dependence on ATC. Once the ADS-B system is fully implemented, ADS-B aircraft will talk to each other directly. Simply stated, you’ll know where the “competition” for your airspace is. In the meantime, if you want reliable traffic information in VFR or IFR conditions, the only way to get it is with an “active” traffic system. “Active” means that your traffic system automatically “interrogates” the other aircraft within your cone of coverage and displays relevant information back to you to on an MFD or Navigator’s display. You can see why the size of that display becomes important—bigger is better when a lot of information is being displayed. L3, Garmin, and Avidyne all make solid “active” traffic systems for GA. If you fly IFR or VFR and you fly where traffic is always an issue or if you want that extra level of security (and have the budget), invest in Active Traffic. It’ll be a number of years before the full “traffic” benefits of ADS-B will be available, but even then your active traffic system will still be relevant. ADS-B traffic is still coming from the ground and from somewhere else—your active system is dependent on no one. TIS Traffic from your enhanced Mode-S transponder or traffic information from one of the portable units is, in my opinion, a false sense of security. Sure, the portable unit is a source of traffic information that you might not otherwise have seen, but, they can also miss targets. TIS offers traffic information when you’re in Mode S radar coverage and zero coverage in other areas—and, again, it’s a re-broadcast from the ground. My concern is that with one of these systems on board, you just might not feel that you need to keep your head out of the cockpit as much as you know you should. Simply stated, you can’t trust a passive system 100% and, in my opinion, anything less is not good enough. The HSI has been a popular addition to IFR panels for many years. The principal is simple: by combining the directional gyro with your primary navigation indicator, you reduce pilot load and provide the pilot with a simplified “picture” of the approach. The concept hasn’t changed, but the equipment has. Mechanical HSIs, the most popular being the Bendix King KCS-55A system, are heavy and very expensive. Today, heavy mechanical gyros are being replaced by solid-state AHRS units and the HSI display with EFIS. Generally, I see the investment in EFIS as a luxury for the average aircraft owner. Don’t get me wrong, the technology is great, but in many cases it doesn’t increase the capability of the aircraft and the money can be better spent on, for example, an autopilot upgrade or traffic avoidance system. On the other hand, if you plan to add an HSI to your aircraft, buying and installing old mechanical technology makes no sense to me. The fact is that you can install an Aspen EFD-1000 Pro PFD for a lot less money than a new mechanical HSI. Plus, you get a fully slaved, solid-state HSI, an EFIS Primary Flight Display (with the option of Synthetic Vision) and a built-in battery back-up system in the event of an electrical failure. Frankly, I see the Aspen units as one of the most innovative pieces of avionics I’ve seen in years. The fact that you can install it (in most cases) without having to cut a new pilot’s panel is pretty ingenious and it can save $2,000 – $3,000 vs. other EFIS options. In the mid-90s, the buzzword in Avionics was GPS. By the mid-2000s, that word was MFD. Today, the word is EFIS. EFIS technology has been around for the corporate crowd for some time, but by the early 2000s we started seeing EFIS units (like the Avidyne systems in the Cirrus and the Garmin G1000) available in a number of new aircraft. Today, EFIS technology is available in the aftermarket as an upgrade to many legacy or newer aircraft. Garmin, Aspen, and Avidyne are the primary players. Simply stated, EFIS technology is lighter, more precise (AHRS) and offers the pilot a host of new features unavailable in the old, mechanical, steam-gauge era. However, it’s also an expensive upgrade at a time when aircraft values are diminishing, so it’s pretty hard to justify the cost unless you plan to keep your “bird” for a long time. It’s still an OEM thing more than an aftermarket thing. So, if you’re shopping for an aircraft with IFR in mind and EFIS is a hot button for you, try finding an aircraft with EFIS already installed. On the other hand, the introduction of Synthetic Vision, available now on most EFIS PFDs, introduces a very interesting benefit to IFR pilots, especially those who fly frequently in terrain sensitive areas. Sure, you need to know where you are, where you’re going, and what “stuff’ might be between you and your destination, but if you don’t know that a problem is developing with your engine “right now,” the other stuff doesn’t matter much. A good engine monitor (scanner) is likely to tell you about a developing problem far sooner than your analog instruments will. The more time you spend in IFR conditions, the more you need this! There’s been no requirement to upgrade private GA aircraft to a 406 ELT, but if you spend a reasonable time in the clouds and over isolated terrain, it’s easy to justify the added expense. First, the Emergency Frequency (121.5) is no longer monitored to the degree it once was, so it’s entirely possible that any “pleas” from your old 121.5/243 MHz ELT may go unanswered. Compared to previous ELTs, the new 406 ELTs are monitored by satellite and can pinpoint your position with considerable accuracy. If you’re down in the woods and injured, time to rescue can be critical—that time saved may equal a life saved. Enough said! Regulations regarding the navigation equipment required for an IFR flight are, at best, ambivalent. For example, would you fly IFR with only one comm and a nav source with VOR-only capability? Many interpret the FARs as allowing this, provided you have the other basic flight instruments on-board. Personally, I would hope that better judgment would prevail! In life, things rarely go as planned and having the right tools for an ever-changing situation can be the difference between a safe IFR flight and the alternative. With the tools available to the IFR pilot today, flying in IMC is safer than ever. If you’re considering adding avionics equipment to your aircraft or shopping for a new IFR platform, get sound advice from a good avionics consultant. As always, you can find me on the Avionics Forum on a regular basis. Happy and Safe IFR Flying!